When clicked, ALL thumbnails for this item link to the same source web page. Printed pieces from the past often have an ineffable quality that can't be duplicated by today's digital tools. As Gene Gable explains, the appearance of these vintage pieces has as much to do with how they were printed as how they were designed. In this installment: Gene surveys popular printing methods, or why a 55-year-old issue of 'Popular Mechanics' looks better today than ever. Alex Thomas is the webmeister at SwanseaCAM, and took this picture of a Peacock on a recent visit to Carreg Cennen Castle, which is located 4 miles southeast of Llandeilo, near Trapp in the western part of the Brecon Beacons mountains known as the Black Mountain, South Wales, United Kingdom. King Solomon in the Bible, Ecclesiastes 1.2, concludes from his search for a life apart from God, that "Vanity of vanities, all is vanity". 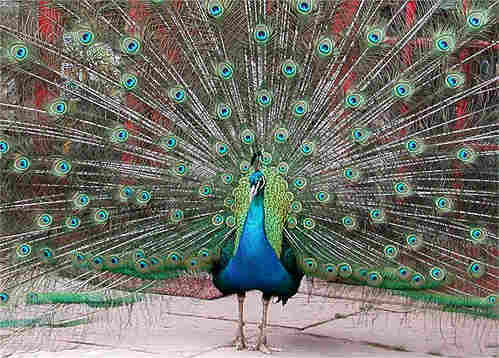 That seems to fairly sum up the male Peacock's way of living, though as a friend of mine was fond of remarking about Solomon's homily, "Hardly a life changing observation from a man unwise enough to have seven hundred wives, some princesses, and three hundred concubines". Truly wise men realize that a man with more than one wife has more than one mother in law! Alex does a thorough photo tour, and notes that although the Welsh Princes of Deheubarth built the first castle at Carreg Cennen, what remains today dates to King Edward I's period of castle-building following his conquest of Wales. Now there was another man with a sense of his own importance. He died on Burgh Marsh (pronounced 'Bruff' in that delightful volte face way of my countrymen) on the Solway coast of Cumbria, looking out towards Scotland. After Edward's defeat by Robert Bruce at Bannockburn in 1314, Scots balladeers were triumphant. Much later Robert Burns wrote a version 'Scots wha hae' and a modern song 'Flower of Scotland' has the lines "...stood against him, proud Edward's army, and sent him homeward, tae think again". Think indeed Edward did. When he had finished thinking he returned, and as Scottish comedian Billy Connolly's jokes "…he came back and gave us a really good f∗∗∗ing!" Edward became known thereafter as 'Scottorum Malleus' -- 'Hammer of the Scots'. Edward gave the Welsh considerable attention. Cunning rather than force of arms seems to have characterized his policies there. He promised the Welsh a prince who 'spoke not a word of English'… then invested his tiny baby son as Prince of Wales. The appointment was revived in more recent times for pomp and ceremony. If you follow Alex' photo tour you will get a good sense of how fourteenth century castle building was used to threaten and subdue conquered territory.